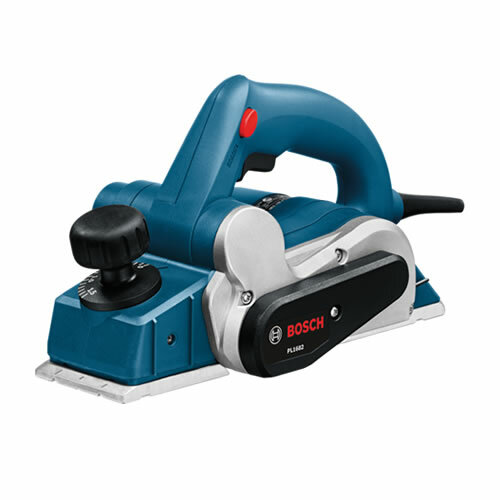 The NEW Bosch PL1682 Planer has excellent features and specifications at a great price point! Powerful 6.0 Amp motor, 16,500 RPM - for fast stock removal and a smooth finish. Electronically-Counterbalanced Single-Blade System automatically positions blade at ideal cutting angle - reduces drag and provides fast operation and smooth finish. Eliminates uneven planning caused by misaligned blades. Equipped with Bosch Woodrazor micrograin carbide blades, which resist fractures from nail and staple strikes. Last up to 2 times longer on 3365 than standard carbide blades on other planers. Ratcheting Depth Knob - allows fool-proof setting of depth increments from 0" to 1/16 in. (1.5 mm) within one revolution, so there is no need to re-zero the depth. Makes deep cuts in one pass.